The appeal of horror movies is that they give people a way to experience the thrill of terror without actually having to put themselves in harm’s way. For the vast majority of us, the movie theater will be the closest we ever get to genuine horror. For others, though, the horror of demons, ghosts, and murderers has real-world significance. These are the people who look closely at real life and realize just how chilling it can be. For evidence of this, look no further than the following pictures, stripped right from the headlines. The world is a scary place indeed. Warning: a few of these are NSFW. 1. Aerial view of the Jonestown mass suicide. An audio recording made on November 18, 1978, at the Peoples Temple compound in Jonestown, Guyana, immediately preceding and during the mass suicide and murder. 2.Finnish fighters propped up this body of a frozen Soviet soldier to scare off Soviet troops. 4. This man is unable to get off the subway tracks in New York City with a train bearing down. 7. Shell-shocked soldier in the trenches of the First World War. 8. The decomposing remains of a girl who got lost and died in the pitch blackness of the Odessa Catacombs in Ukraine. 9. The aftermath of a horrifying car accident in 1945. 10.Found in the ancient city of Herxheim (dating back to 7,000 years ago) in Germany, these remains and artifacts found, show clear signs of flesh-stripping. A process which served as preparation for cannibalism. 11. The body of John Torrington. In the 1840s, John Torrington and a crew of explorers attempted to find the fabled Northwest Passage that would allow for quicker travel between North America and Asia. However, during the expedition, Torrington’s ship was damaged, and the crew was forced to trek back through Canada on foot. No one made it back. Torrington’s body was buried along the way, perfectly preserved by the frigid temperatures. 12. The last photo of 14-year-old Regina Kay Walters. This was taken by serial killer Robert Ben Rhoades who had cut off her hair and had her wear a black dress and heels. This was before he killed her in his torture chamber in an 18-wheeler. 13. The remains of a victim of spontaneous human combustion. 14. Shadows of people vaporized when the atomic bomb was dropped on Hiroshima. 15. Aftermath of the 1997 Heaven’s Gate suicide in San Diego, California. 16. The so-called “elephant’s foot” at the heart of the melted-down Chernobyl Nuclear Power Plant. 17. Pennsylvania politician Budd Dwyer moments before he ended his life on live TV. 18. Nazi commander Joseph Goebbels after learning the photographer here was Jewish. 19. 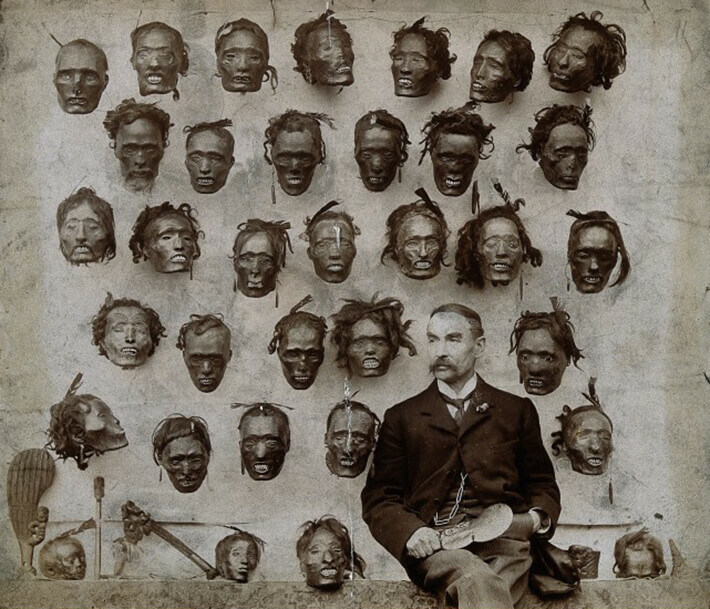 Soldier, artist and collector Horatio Gordon Robley with his collection of preserved Maori tattooed heads, also known as Mokomokai. 20. A woman leaps from the top floor of the Genesee Hotel in 1942. 21.Not a scary picture, yes. But actually, this photo shows a hotel owner pouring acid in the pool as black people swim in it in 1964. Horrible.